When the late Yasser Arafat used to predict that “the womb of the Arab woman” was the Palestinians’ “strongest weapon”, he meant that the Arabs of Israel and the Palestinian territories would outbreed Jews, and thus overwhelm the Jewish state by virtue of their superior numbers. Of course, this was before Israel’s Gaza pullout and falling Palestinian birthrates changed the demographics in Israel’s favor quite drastically. Nonetheless, the narrative regarding this so-called ‘demographic time bomb’ still informs much of the debate about the Palestinian-Israeli conflict, at least amongst those who argue that a two-state arrangement must be achieved immediately to save Israel from a situation where a Jewish minority rules over an Arab majority. This is the broader context within a claim in a March 19th Times of London post-election editorial, Myopia in Israel, on Binyamin Netanyahu’s putative reluctance to support the creation of a Palestinian state under current circumstances. he [Netanyahu] offered young Israelis no sense of how the country should evolve if it rejects a two-state solution. Matching the prospect of an Iranian bomb, Israel is faced with a demographic time bomb. The birth rate among Arab families in Israel is so high that at some point Arabs will form a majority. The choice will be even more uncomfortable than the one posed on election day. It will be between Israelis having a Jewish state or a democratic one. Though the revised language still renders the sentence extremely hard to decipher, even the narrow claim that some fear that “at some point Arabs will form a majority” due to “high birthrates” is very misleading. If they’re referring to the percentage of Jews and Arabs in Israel (not including West Bank Palestinians), there is no such “fear” of an Arab majority. The Jewish population of Israel is currently 6,186,100, while 1,709,900 citizens are Arab. Further, demographic studies demonstrate that the Israeli Arab birthrate today is almost exactly the same as the Israeli Jewish birthrate (at around 3 births per woman), and that Jews are projected to constitute a strong majority in Israel over the foreseeable future. Alternately, Times of London editors may have been referring to the population of Jews and Arabs in both Israel and all of the West Bank. However, even then, there doesn’t seem to be a threat that Arabs will soon form a majority. Even if you add 2.7 million West Bank Palestinians to the equation, that leaves us with nearly 6.2 million Israeli Jews compared to 4.4 million Arabs (again, in Israel and all of the West Bank). 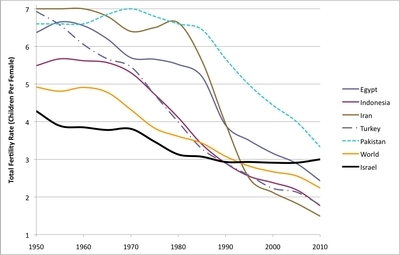 Further, the birthrate of Palestinians in the West Bank, now at about four births per woman, has dropped considerably over the past several decades and now is only marginally higher than the Israeli Jewish birthrate. So, if Israel continues to maintain control of the West Bank, and if current fertility rates among Jews and Arabs continue, then, according to a comprehensive study by Sergio DellaPergola, a Hebrew University professor and expert on Israeli population studies, by 2030 Jews will still be a majority (within Israel and all of the West Bank), constituting 54 percent of the population. DellaPergola only envisions an Arab majority (if current trends continue) by the middle of the century. The ‘Arab population bomb’ in Israel doesn’t exist. The ‘Arab population bomb’within the territory of Israel and all of the West Bank is decades away. Though there are good reasons to continue conducting bilateral negotiations in hopes of reaching a two-state deal, those who suggest that such unimaginably complex political and security arrangements need to be agreed upon immediately due to an imminent demographic time bomb are simply ignoring the relevant demographic data. Where is this mythical ‘West Bank’, Adam? I’m sure the following articles in Israeli newspapers will help you to locate it, Leah: ‘Israel nabs Hamas cell based in West Bank suspected of plotting attacks’ (Haaretz, March 22); ‘Real Madrid coaches Palestinian children in West Bank’ (Times of Israel, March 23); ‘Analysis: Islamic Jihad gaining strength in the West Bank’ (Jerusalem Post, March 23). You really really have no clue, do you? Then please enlighten me, Who’s decision on the current naming of that piece of land should I (and Adam – and the Israeli Press – and everyone else in the world) take to be the “correct” one? what are you haggling about now ? The name of a piece of land ? Jeez , if you were in a round room you would argue where the corner is . This is a site to highlight anti Semitism in British Press . Just for once can you deal with on topic . I cannot recall you saying – anti Semitism is wrong . 2. UK Media Watch’s purpose isn’t only “to highlight antisemitism”. It is also “dedicated to … promoting accurate reporting about Israel”. And this article’s topic falls squarely into the latter category. 3. If you cannot recall me saying “anti Semitism is wrong”, that’s because you have selective hearing amounting to profound deafness. On at least four occasions – two of them in posts addressed directly to you – I have made it absolutely clear that (a) I thought it “deficient and defeatist not to challenge antisemitic remarks” and (b) described antisemitic language as the “blaring out of foul tunes”. But just in case you think none of these comments hammered home explicitly enough that I think antisemitism is wrong and needs to be combated, I’ll say it now – once and for all, in the big sloganising capital letters you seem to require, and for the record: ANTISEMITISM IS WRONG. 2 address the article and not the poster . 3 I just like the sound of peeps saying anti Semitism is wrong and evil . If peeps shouted it louder and more often then we wouldn’t be in this mess would we ? Beyond pathetic. Are you saying that you are ignorant of the fact that ‘West Bank’ was the name invented to give bogus respectability to the illegal Jordanian occupation of what has always been J&S? The PLO inflitiated the numbers for propogande purposes. Adam, in the West Bank there are 1.7 million Palestinians. The actual figure is about 1.4 million. The Arabs are double counting those that are counted under Israel. Shocker00–lying bigotry from the British press. These people should be ashamed of themselves. … And is CifWatch there including Jews in the West Bank as being “in Israel”?